THIS is the first non-football article I’ve written on this site, but somebody had to speak up, so it may as well be me. 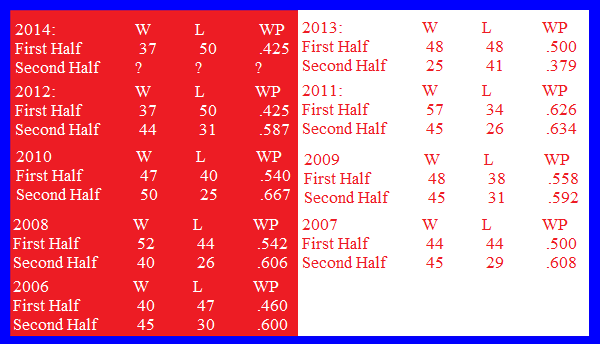 The Phillies are 12 games back and off to the worst start in 17 years. Granted that’s hard to go out and cheer for; but the amount of whining and the number of fans bailing on our team, has gotten downright embarrassing. And it more or less does this going all the way back to 2002. You know what? Even though we’ll probably still finish in the toilet, all the bailing on our team has to stop. This is making us look bad folks. Right now you and I are dragging the reputation as baseball’s biggest bandwagon fans. And this isn’t just the words of some jackoff, rival fan badmouthing us. This is a national study. This is us getting our own actions thrown in our face, while the rest of the nation gets told (and offered proof), that all of them are essentially better than you and me. We have to up our game fellow fans. I don’t care if you show up to more games, give a player props on a call-in show, send a tweet of support to a player you follow, whatever. Whatever you do, just put some love out there to our guys. Good or bad season be damned. Whether we shake it off and make a run (as is the team’s custom), or whether we go down swinging; let’s finish 2014 with our backs against our player’s backs. We’re better than bandwagon, so let’s up our game and show it.